The All Terrain Recon Transport (AT-RT) is a small all terrain vehicle for a single soldier used in reconnoissance and patrolling operations. The AT-RT is a very light-weight vehicle so it is vulnerable to heavy fire. 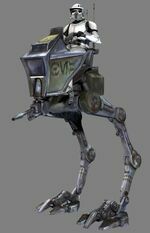 The AT-RT is used as a police vehicle in planets such as Coruscant, and as a scouting and recon vehicle in planets during wars. Since the AT-RT is so light it is able to jump and run at tremendous speeds. The AT-RT lacks a closed cabin giving the clone trooper a clear view, but leaves the driver vulnerable to small-arms fire. The lightweight cannon the AT-RT boasts is great against infantry troops, but is weak against armored units such as crab droids and spider droids.